Connectors – what are connectors ??? Q1 : What are connectors ??? 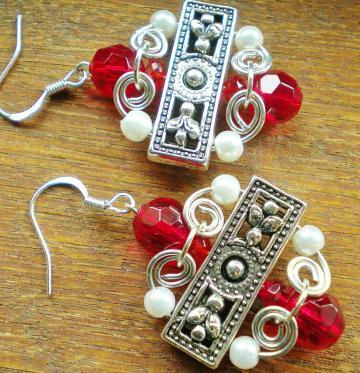 Connectors are metallic pieces which usually form the centre piece in making earrings mainly .These can also used like pendants in other handmade jewellery like necklaces etc. Q2 : Where can I find these connectors??? Pretty much in every bead shop. Craft stores and even online. 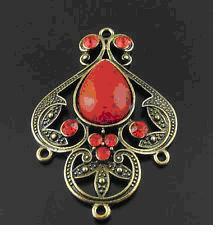 They range from colour to shapes and even number of strands .These are also called as multi strand metal components . Q3 : Why do we use these connectors ? These connectors usually are used to chandelier earrings or pendants . Q4 : Can we make our own connectors ? 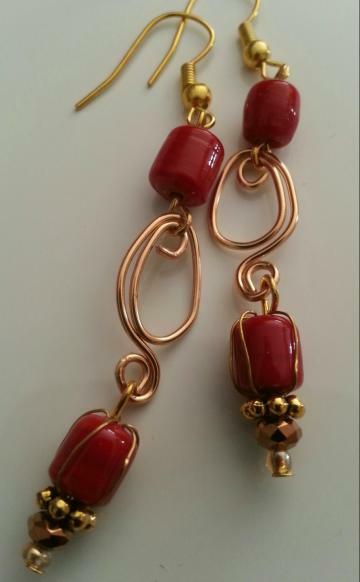 Enjoy making handmade jewelry more using connectors ! 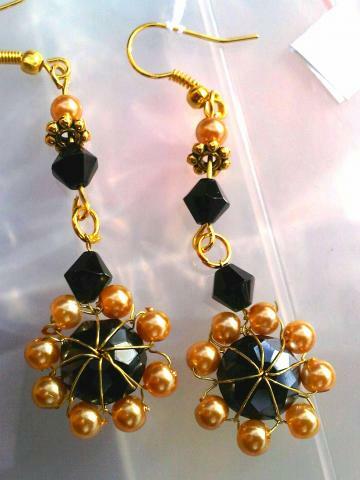 These earrings are made with swarovski crystals,where i have woven the glass pearls around the crystal using the beading wire.I then have combined them eith glass black bicone beads to make the dangle earrings. 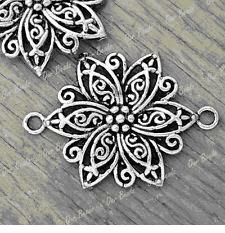 I found these gorgeous antique silver toned 3 hole spacer beads online and I could not resist from buying them. Though I love them, these spacers were a bit too big for me to make bracelets. That’s when I had to design something out of these beautiful pieces. 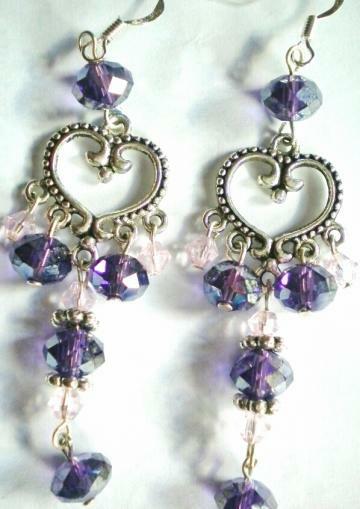 I designed these earrings using the wiring technique along with the regular beading technique. 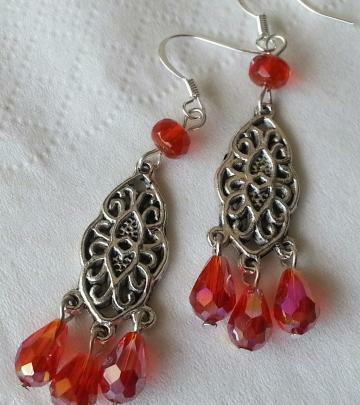 Finally the earrings came out stunninig! ! I know that I havent updated my shop and blog with my new stuff.I havent been able to do much lately. 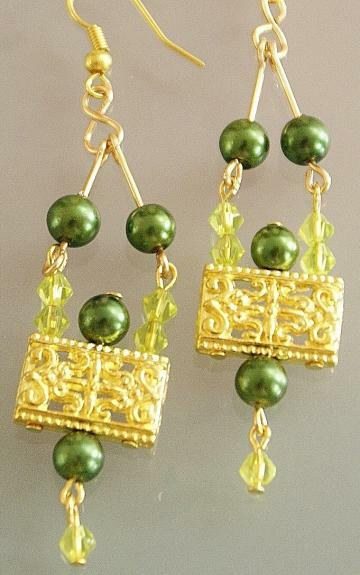 This fantastic and grand pair of earrings is made with dark green glass pearls and light olive green bicone glass beads .The earrings are incredibly light weight to wear yet very grand . 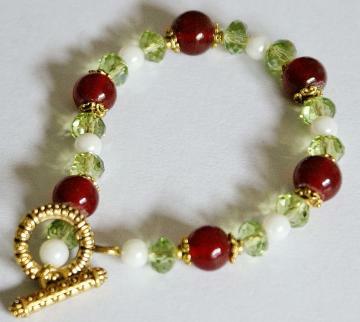 This is a very gorgeous bracelet made with Red glass beads ,white glass perals and light green crystals . The bracelet is generous 22cms in length and has antique toned circular toggle clasps .